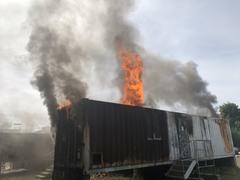 Recruit firefighters will be participating in state mandated live fire training this afternoon until approximately 5PM. The training will take place at the Alameda County Fire Department Training Tower (890 Lola Street) in San Leandro. There may be intermittent occurrences of black smoke in the San Leandro area (near the intersection of Davis Street and Alvarado) that may also be visible from BART and Interstate 880. If you see smoke and are unsure if it is coming from the training, please do not hesitate to call 911.